In the 10 years that we’ve been running our writing courses, many good things have come out of Dark Angels. Along with sharpened senses, there have been new friendships, changes of personal direction, and the publication of writing of all kinds – stories and poetry, travel and memoir – that might not otherwise have seen the light of day. Until now, though, there has never been a wedding. Yesterday Elen Lewis and Martin Lee were married in London. Elen is a novelist and freelance editor, Martin one of the founders of research firm Acacia Avenue. Both are Dark Angels of long standing – Elen joined the host in 2006, Martin in 2007. Both wear the full Dark Angels insignia – harp, halo and wings – having been through the advanced course and masterclass, participated in the Other Worlds exhibition at the Oxford Story Museum, and taken leading roles in our collective novel, Keeping Mum. They are also two of the nicest people I know. To my great regret I couldn’t be there, as Sarah has just had surgery and has to keep her foot up for two weeks, and I am in attendance. But something unexpectedly good has come out of her misfortune and my absence from Elen’s and Martin’s wedding. When I’m working at home I often play the piano for ten minutes or so while I’m waiting for the kettle to boil, or just need a break from my desk. On Monday I was doodling away and out came a sequence of chords that seemed to convey something particularly heartfelt, although I wasn’t quite sure what. Then I remembered that I had just emailed Elen and Martin to apologise that I definitely wouldn’t manage to get to London for the wedding. The emotion I had expressed on the piano sprang from that, and it struck me that I could send them a piece of music instead. Although I still play regularly, it’s many years since I last properly recorded anything. In those days it was a laborious process involving the constant mixing down and re-mixing of tracks onto tape. Today, hey presto, my Mac comes with a built-in digital multi-track recording programme. Feeling as if I was playing truant, I got out my guitar, hooked up my piano, and vanished into the depths of GarageBand for the rest of the day. What fun it was. And how much I realised I had learnt since last sitting down to record something. Then I would have agonised over every semi-quaver, playing and replaying each sequence until the piece was note, pitch, tone and beat perfect. This time, when I was halfway through I thought: this is a just a sketch for the finished piece. But by the time I reached the end I realised that it was the finished piece. I was settling for spontaneity, mistakes and all, simply trying to capture as much of the original feeling as I could ­– something warm and breezy, upbeat and celebratory. So often on our courses I’ve shared people’s delight at what they’ve been able to produce at short notice, writing essentially for themselves, without the pressure of a future audience, only to discover that what they have written is something worthy of an audience anyway. Almost always it’s because they’ve tapped into an emotional seam, starting with something felt rather than something reasoned. That is where I started with my Funky Fanfare for Elen and Martin, and you can judge whether I succeeded or not below. But it felt good to take a spoonful of my own medicine and allow myself to become a more or less spontaneous conduit for their joy. It also felt good to be reminded of the pleasure to be had from making recordings, and I will now do more. So thank you, Elen and Martin, for the inspiration. I know you’ll find much happiness together. And here they are (snapped by another Dark Angel, Gordon Kerr)! I’m taking a summer break now. I’ll be back mid-August, though I will be posting on the referendum meanwhile – see the link in the column opposite or the Referendum tab above. Gallery | This entry was posted in Dark Angels, Love, Music, Uncategorized and tagged Elen Lewis, GarageBand, Martin Lee. Bookmark the permalink. Bravo! Thank you for sharing this. The music is amazing. What a special gift to give. Oh dear, Jamie. I feel a whole new distraction technique has just revealed itself! You have always had a wonderful feel for music, as good as your feel for words. Technology has just revealed another outlet for you. How will you make the time!!? 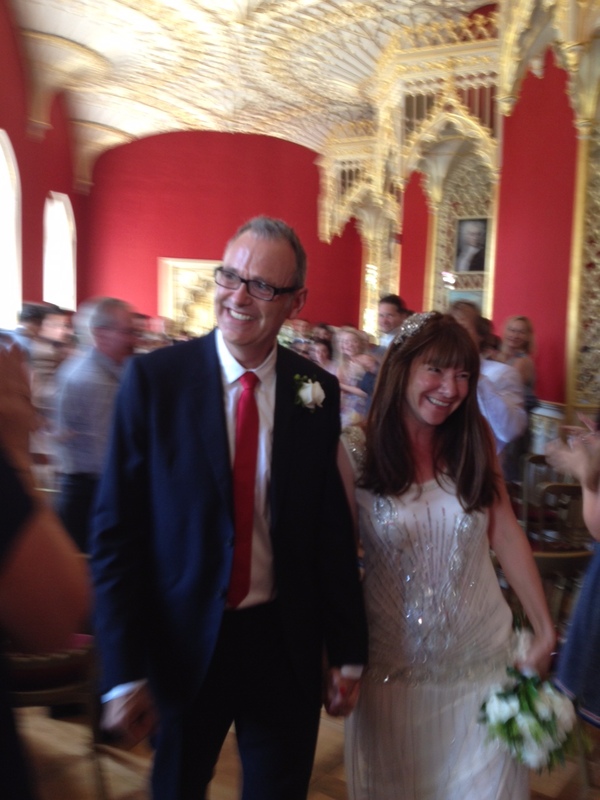 Jamie, Martin and Elen were married at a beautiful ceremony in Strawberry Hill House, with readings and music. As they walked between us at the end of the ceremony the fanfare played was Stevie Wonder “Signed, sealed, delivered”. Yours makes a lovely addition to the day. Beautiful Jamie, I’d love to hear more – do you have a SoundCloud? If not, hope that perhaps it’s something you might consider now you’ve rediscovered your recording self?! Well, if I were Elen and/or Martin I’d be well pleased with that wonderful gift from you, Jamie! James you’re right, and I am that Martin, and I can tell you that we were thrilled. It’s also lovely, Jamie, to read about it here, and thank you for sharing your gift to us with everyone else – it magnifies the gift. We did have a spectacular day, and now we have your fanfare as well to remind us of the day whenever we want. Thank you once again and we hope to see you as soon as possible.